I don't think I was actually ready to say goodbye to this series! The Immortal Rules was probably one of the first few books I reviewed after starting blogging, and The Eternity Cure was one of my favorite books of 2013. Like, I put down The Eternity Cure and started wondering how many days it would be until I could get my hands on the third book. 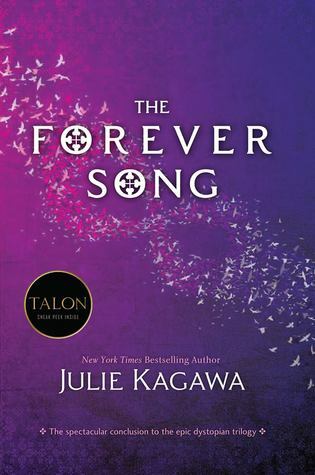 The Forever Song picks up right where book two left off, with Allie and company still left reeling from their last showdown with the evil vampire Sarren. Allie is clearly struggling with her emotions after this, which makes for interesting reading, to see what she's like when she fully embraces her dark side. But. The drama and angst got to be a bit much for me. I mean, it makes sense from a logical standpoint -- Allie, who has always been a bit angsty, has had a lot of terrible stuff happen to her, and then one good thing, and then even more terrible stuff. She has every reason in the world to be angry, and then unsure, and all of that stuff. She lets those feelings cloud her judgment and makes some real stupid mistakes that drive the plot, sure, but which also made me facepalm. I think if I were more in the target age range, I would be right there with her, though, so this is maybe just another case where I'm too old for the lesson that's really being taught, underneath the drama. Jackal, Allie's favorite/least favorite brother, is back here, and he is a definite bright spot, with his sass and sarcasm. Allie needs someone to tell it like it is, and even though he's crude, he's also not often wrong. Besides, every book needs its pessimist who's just looking out for themselves, and Jackal is great at that. I think I predicted most of the major plot points here, so the book may not keep you guessing, but it definitely keeps you engaged with a lot of very intense action scenes, which Kagawa excels at writing. This book is no different from the other two in the series in that it features a lot of gory violence and strong cursing. Honestly, it's a refreshing change of pace for me, reading YA, to see books that are unafraid to show the violence of the world they're inhabiting. I don't want to make it seem like I didn't like this book -- I really enjoyed it, and at a time where I'm setting aside books right and left (thanks reading slump, ugh), it was good to pick one up that I really wanted to just read straight through. Although it has its weak points, it is a good end to the series, and I think will satisfy fans who have been eagerly awaiting the final installment. I've been reading some mixed feelings on this book. But it is good to hear that is wraps things up. I am still really eager to read it! !